While searching through my saved stuff in my computer. I came across this article I had saved back in 2014. It was written by the Hippocrates Health Institute, famous for raw food, Detox and Cleansing programs located in West Palm Beach Florida. I’ve followed them for years and have had many clients go into their 3 week detox program. This article, I think explains Colon Therapy in a great light and gives you a good history on the topic from a well respected centre. WEST PALM BEACH – Like the pink elephant in a room, colon hydrotherapy is one subject most people feel uncomfortable discussing – however for those brave guests like, Hippocrates Health Institute Alumni, they personally reap the benefits of a cleaner, healthier colon. There is much debate in the medical field as to whether or not cleaning your colon is beneficial or detrimental to your health. Some doctors state that it is best to let your body do its own work. However, how many of the” naysayers” have actually had a colonic and witnessed for themselves the benefits? But for those like American Dr. J.H. Kellogg, who administered colonics to his patients in the 1900s, he touted the benefits of colon hydrotherapy as a means to clean the internal body naturally, while eating a high fiber diet and many fresh vegetables. Kellogg reported in the 1917 Journal of the American Medical Association that he used colon hydrotherapy on about 40,000 of his patients and that in all but 20 cases he used no surgery for the treatment of gastrointestinal disease. “We are literally poisoning ourselves into illness when the bowel evacuation is deficient,” said Kellogg in the Journal of the American Medical Association in 1917. The colon may be the most overlooked function of the body because it naturally eliminates on its own. 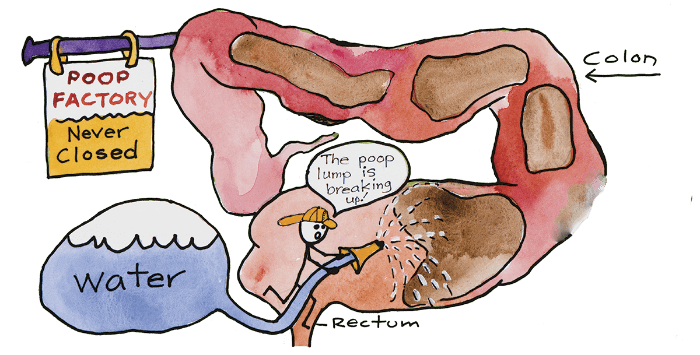 However, after years of building up impacted waste along the colon’s wall, the toxins may get reabsorbed. If this happens, like Kellogg believed, it effects the body’s tissues and the cells become capable of triggering a variety of illnesses. In 1908 Russian Scientist, Elie Metchnikoff received a Nobel Prize for his research on immunity. He studied how diseases occur due to the build-up of toxins in the body, finding that intestinal toxins actually shorten a person’s life. Mechnikov also developed a theory that aging is caused by toxic bacteria in the gut and that lactic acid (like probiotics) could prolong life. Most people have one bowel movement a day and think they are regular, said Lynn Konicki, a colonic therapist at Hippocrates Health Institute for 10 years.